Roman Catholics and Anglicans in West Yorkshire have joined together to share Bible studies. Members of churches in Wakefield and Leeds designed the study course together in what they have called a "groundbreaking" move. It follows a commitment made two years ago to work together. 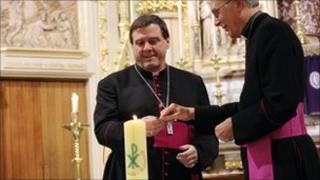 Bishop of Wakefield the Right Reverend Stephen Platten said he believed it was the first joint Lent course run between the two denominations in England. He said he was "very proud" of the course, set up by the Church of England diocese of Wakefield and the Roman Catholic diocese of Leeds, together with the Roman Catholic diocese of Hallam. Groups from local churches have met to study and pray, led by members specially-trained at the Mirfield Centre which is part of the Community of the Resurrection, a religious order of the Anglican Church. Bishop Platten said: "I am delighted that all four bishops in the dioceses have been so enthusiastically supportive of it." The course was created following a historic Joint Assembly of the two denominations in 2009. The course, called Praying the Scriptures, is based on what is known as the Lectio Divina, or "sacred reading", which is a method of reading the scriptures used by the Roman Catholic Church.